28 LISTS Just Bible StuffLists about real things in the actual Bible—and what some people just *think* is in there. Like many theological quandaries, the Holy Spirit's gender might at first seem straightforward. On closer examination, though, unanswerable questions can become more obvious: Would God have a gender? If God does have a gender, does the gender change Jesus's relationship with God? If Jesus is male and the Holy Spirit is female, are they not of the same substance? These questions may seem esoteric, but for many early Christians, the issues were fundamental problems that needed a resolution. The Bible's precise semantics are notoriously difficult to interpret; the literature has been translated, retranslated, and changed over the centuries. The issues addressed within the religious text are complicated, especially when it comes to the representation of women. Though there are some strong women in the Bible, throughout much of Christianity's history, women have been treated as subordinate to men. Also, many religious authorities have ignored the possibility of the Holy Spirit being a woman. In the Gospel of Thomas and the Acts of Thomas, the Holy Spirit is directly referred to as female, as Jesus calls her his "true (Mother)." The language is clear; this ought to settle the issue entirely, right? It doesn't. These two books turned up in 1945 at Nag Hammadi, Egypt. They are part of the Apocrypha, a group of religious texts developed along with the Bible that deviate from the canon of scripture. Some scholars believe the Gospel of Thomas and the Acts of Thomas are Gnostic writings developed from a branch of theology that the Council of Nicaea declared heretical in 325 CE. The texts appeared to suggest Jesus was not divine, but solely human. Before becoming Rome's official state religion, Christianity existed in scattered pockets throughout the empire, and women held critical religious roles both in practice and theology. There were numerous references to a female Holy Spirit during Christianity's early period. From baptism, we receive the Spirit of Christ, and in the same hour that the priests invoke the Spirit, She opens the heavens and descends, and hovers over the waters, and those who are baptized put Her on. After Christianity became a Roman state institution in the fourth century, women no longer had a substantial position in the church, and religious writings minimized references to a female Holy Spirit. Hebrew, in both its contemporary and ancient forms, has a high degree of gender specificity. Almost every noun has a gender, and there is no equivalent to the English gender-neutral word "it." The word that describes the Holy Spirit in the Old Testament, "ruach," is a feminine noun. Also, when the Old Testament was translated into Syriac - a form of Aramaic - scholars used a similar feminine word, "rucha," to refer to the Holy Spirit. Most of the New Testament was originally written in a language called Koine, or Alexandrian Greek. The Greek word for the Holy Spirit is the gender-neutral word "pneuma," which suggests the Holy Spirit's gender is unknown. 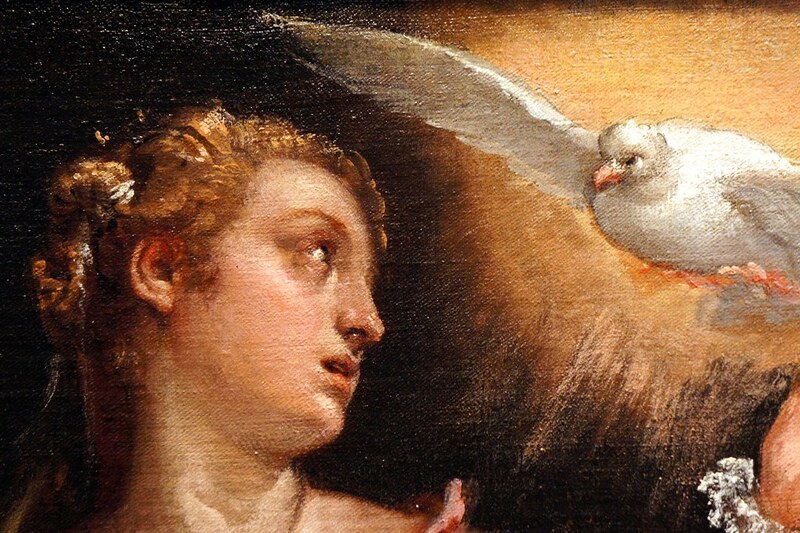 In the fourth century, when St. Jerome translated the Bible from Greek into Latin, he transposed "pneuma" using a masculine word, "spiritus," forming the modern assumption of a male Holy Spirit.